Amongst a trillion pictures taken at the Tata Mumbai Marathon 2019, the above was the most heart pulling picture that every runner who ran that route was envious of! It was 8.55 am – the Full Marathoners had left the sea-link and it was near about time to wrap up photography at Sea-Link. Half marathoners had left long time back and a particular unofficial photographer had just finished taken the picture of last few runners on Sea-link. The picture below is of the last group of runners on sea-link. For the photographer – it was now time to wrap up and leave. But something made him stay back…he was walking slowly…and then what Chetan saw and clicked – has gone viral in the photography of running world. His frame captured the majestic sea-link and one runner on it who had the whole of that structure to himself. Sea-link is closed to traffic only during this marathon and it’s quite a marvel to be alone on this structure with no traffic and that too just to be running on it. Nobody knew who this runner was, Facebook had gone nuts about this picture but there was no one to claim. Chetan relentlessly went around finding the last runner on Sea-link through his social media contacts. I was keen to do a blog on these two! Me: The Half Marathon timing at Tata Mumbai Marathon was 5.30 am. But you started running at 8.30 am. Why did you run so late ? Sujay: So everyone knows that I started the marathon at 8.30. There is a long story behind it. It was Saturday evening (the day before marathon) and I had some dinner plans with my friends. So I took out my brothers car and left. I also had to collect my bib so I left early. After I collected the bib I headed for dinner. I was only going there for an hour or maybe 2 hours max as I had to return so that I can get enough time to sleep. So had dinner and was heading back home it was around 10.30 pm. While heading back I just dropped by to refuel the car and after it was refueled something triggered inside the engine and it stopped. So I tried to start it again but there was no ignition. I took help of some people to park it outside so that it doesn’t get in anybody’s way. Then I called my brother. Thankfully we had another car. He reached my location and tried to fix the engine but in vain. Then we called the road side assistance to fix the car. They told it might take an hour to reach and It was already 11.30 pm. We called customer care and they told us that the guy cancelled it. So they dispatched another guy and he reached at around 1am. He also tried to fix the car and still wasn’t able to. Finally he decided to tow the vehicle and take it to the garage for fixing it. So he went to the garage and bought the towing vehicle. It was our new car only 6 months old and so we also took a video of the car getting towed for the first time. After that he took the car and we returned home at 3 am. By now I had lost hope of running in Marathon as you need proper sleep so that you don’t have any injury. I slept and woke up at 7.30 am. 4.5 hours of sleep not that bad but it was very late. I then decided just to reach the event even if I don’t get to run I will atleast watch and cheer the runners. I reached at the starting point at around 8.20 and I saw no one running as it was already 3hrs late. But then I saw some 42k runners running from the starting point and that gave me the motivation. I started running. Also you don’t get to run on sea link that often. To Sujay, it didn’t matter when he started. After a night’s ordeal, he was happy enough to be running and actually finishing his first half marathon. Me: How did it feel to be running alone on the majestic Sea-Link? 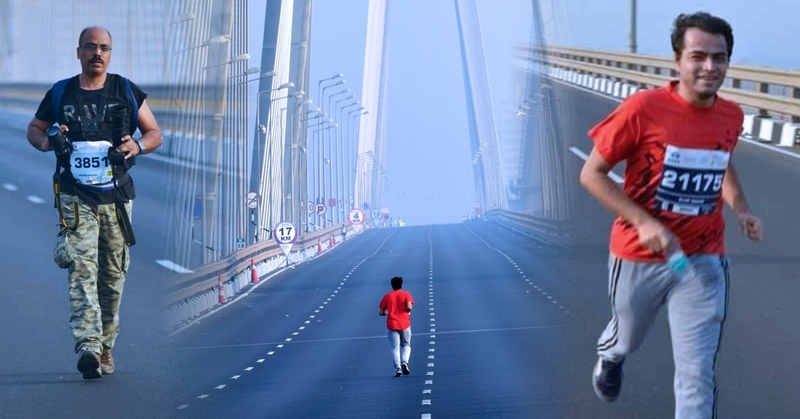 Sujay: While I was running on the sea link alone it felt as if like the whole sea link was mine at that moment. Nobody to stop me from enjoying the entire sea link scenery. I had forgotten all the frustration that happened last night. Also there were people motivating and cheering me one of them was Chetan also. (If you might be familiar with dragonballz anime then sea link could be the analogy of snakeway and I was feeling like Goku running on the snakeway who was also running alone). This was one lifetime experience for me. Me: What are you thoughts about your photo that went viral? How does that feel? Sujay: About the photo it was unexpected. It was my first 21k Marathon and it started with a blast. You know what they say if something happens it happens for a reason. After it went viral I started appreciating life even more. It has bought a huge change in my perspective and the way I look at life. Me: Do you have a message for Chetan ( who photographed you on Sea-Link)? Chetan found Sujay’s number and met him. He also gifted him the picture he had taken for Sujay at the Sea-Link. This picture has gone viral in India’s running community. Sujay: About Chetan he has inspired me a lot. He himself has been into couple of half and full marathons and I have barely scratched the surface. I don’t know much about him as we have only met once but he is a very enthusiastic person who is also a great photographer. For Chetan I would say that keep up the good work. I have been inspired to do more marathons this year and coming years just because of him. I hope you inspire more runners to stay motivated and run without thinking of winning or losing. Me: Are you coming back to run Tata Mumbai Marathon next year? Do you again want to be the last runner on the sea-link? Sujay: I will be participating next Marathon and next time I won’t be starting soo late. No matter how much popularity you get while running alone it is always better to run with other people around thats the fun of it. The kind of energy you get cannot be compared. But with that being said I will be running for sure next year no matter how late I might get if something goes wrong the day before let’s leave that to fate. About Chetan Gusani who was an unofficial photograher that day. He is a runner and a fitness enthusiast himself. When asked to introduce himself, this is what he had to say – Photography is in my blood. If I am not running, then I love to be on the route with my arms and ammunition to shoot runners. My most appreciated work is the pictures I have taken at Tata Mumbai Marathon 2019. Guess what – Chetan has many requests from runners to make them the last man/woman running on sea-link now! Inevitable request, you think? Thank you Tanya for bringing such a inspiring and motivational story. They say it’s never late to start running and this story tells a lot. Loved reading this! The mysterious runner now discovered ! What an awesome first half marathon!! Wishing Sujay great running years ahead !!! All thanks to Chetan Gusani ji who captured the magnificent pic!!! Only Tanya can make a hero out os a late comer. I have arrived late for as many races as I can remember. The only running organizer in NCR at one time was RnL, and by God, I was late for eacxh of his races. Not super late, but 5-10 minutes late. Except the time I paced a first timer to her first 8 hour marathon. Then I was before time because I wasn’t running for myself. Apart from all of Rahul’s runs, I was late for my first ever Half Marathon. It was called the VDHM that year (Airtel took over nexxt year). I was almost barred from entry, so that ensired that I was always on time for my ADHMs! In my 50th year I decided to run the 50 mile at Bhatti. I was late by half an hour. Oh, and by the way, I am the most poorly photographed runner when on time! Chabbra Ji. You are a hero in my eyes. The one who runs barefoot, takes his dog out for long walks late in the night or whenever, the one who has tamed asthma through running. You are an inspiration.